IDBI Bank Executive Recruitment 2019: Industrial Development Bank of India (IDBI) has released a recruitment advertisement to hire executive personnel. Candidates will be selected through an all India basis open competitive examination. Interested candidates may apply for IDBI Bank Executive Recruitment 2019 on or before the last date which is 15th April 2019. Further essential details such as eligibility criteria, registration fee, selection process and steps for IDBI Bank Recruitment Executive Apply Online 2019 are covered in the below section. Latest Update: IDBI has released the Executive Recruitment 2019 Notification for various vacancies. Interested candidates can fill the application form on or before 15th April 2019. The IDBI Bank has been announced the Recruitment notification for Executive 300 Vacant posts. As per the Bank Recruitment official notification, candidates will be initially hired on a contractual basis. The contract would be initially for a period of 1 year and this may be further extended based on the performance, completion of assigned mandatory e-learning certification. Details of IDBI Executive Notification 2019 are as follows. Details of IDBI Bank one time registration are elaborated in the below section. Other crucial details such as IDBI Bank Application Form 2019 payment, last date to apply online and admit card availability date shall be asunder. The application process for IDBI bank executive recruitment is under process. 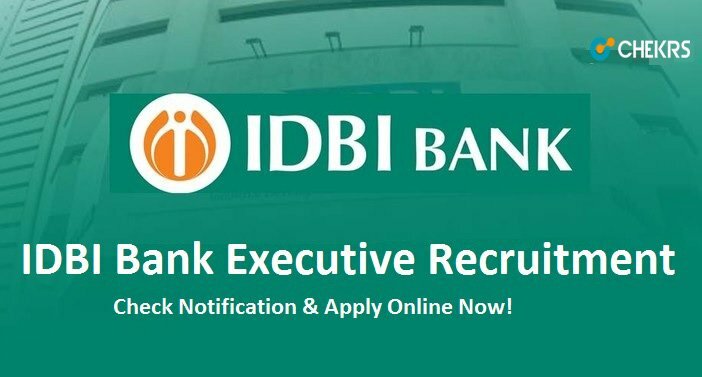 Eligible candidates may apply for IDBI Bank Executive Recruitment 2018 before the last date. While filling up the application form strictly adhere to the eligibility criteria. Failing to this may lead to cancellation of your candidature at any time during the selection phase. Terms and conditions which are strictly required to follow at the time of IDBI bank Executive recruitment online registration are as follows. Applicant must be either, an Indian citizen, or citizen of only these countries – Nepal, Bhutan, Tibetan. For further details regarding the nationality, refer to the detailed notification. A Degree of graduation in any discipline from a recognized Govt. (University) of India or any other equivalent qualification recognized by the Central Government. Candidates who are in the final year of their Graduation/ Semester are also eligible to apply. Candidate must possess 60% in graduation, and SC/ST/PWD candidate must possess an aggregate 55%. Note- Final Year students who are applying they have to produce a valid proof of graduation examination at the time of provisional selection. Applicant age must be between 20 years to 25 years. Candidate must not be born earlier than 02 January 1993 and not later than 01 January 1998. However, for reserved category candidates, there are some age relaxation criteria. and Rs 18,500 per month in the second year. Application fee could be paid through e-banking. Eligible candidates’ while applying online please fill the IDBI Bank Executive application form as per below-given instructions. And at last, take a print out of the filled application form. Candidates will be selected on the basis of performance in the written test. For IDBI Executive recruitment only one single written test will be organized. And after considering marks of IDBI Executive Written Test and medical test candidates would be provisionally selected. Note-I: For IDBI Bank there is no provision of Interview, candidates will be directly selected for the executive post only on the basis of merit of written test. Note-II: Candidates’ who have any query regarding the Job profile, they can consult us through the below-provided comment box, our team will reply to you shortly regarding this.